First, a disclaimer: Though the Five Ten Guide Tennie was built by a venerable climbing company as an approach shoe for pure rock-heads, I'm going to review it as a mountain bike shoe and day hiker, because those are my jams. I haven't climbed in nearly 20 years, and, though I hope to flail around on some local boulders with these, it'll be rare. I hesitated for at least a year to spring for the Tennies—the $140 price was literally double what I paid for my previous mountain biking shoes, the estimable Teva Crank (sadly, now out of production). This time around, I wanted something with a stiffer sole and more toe protection. I'd been thinking approach shoe for some time, and the Tennie is the handsomest and most popular of that genre. I've only had the Tennie for a few weeks, but I've put it through some paces. Out of the box, the shoe fit exactly as I'd hoped (and very true-to-size). It's climbing pedigree gives it extra lace holes down by the toes, which allow a custom-fit feeling. The thin, tough laces slip easily through the holes and allow me to cinch down where I want it snug and loosen up where I don't. But when I tie them off, they stay put. I worried that the famed Stealth C4 rubber sole, so sticky on rock, would be too soft for pedals with pins. On two of three pairs of pedals (the ones with blunter pins) they have the perfect level of traction and allow me to micro-adjust my footing while also feeling firmly rooted. On the third pair, with sharper pins, the soles stick a bit too much and get slightly chewed up. Over multiple two-to-three hour rides, the shoes have left my feet feeling ready for more, and they show no wear on the uppers. They feel incredibly solid, so I expect them to wear very well. Finally, they're just so cussedly handsome, I want to wear them everywhere. Quibbles are minor. First is the lack of breathability; I had them on all day at one point, and when removing them, got whacked in the face with an potent blue cheese aroma. (The canvas version might solve this, whilst saving a few bucks). 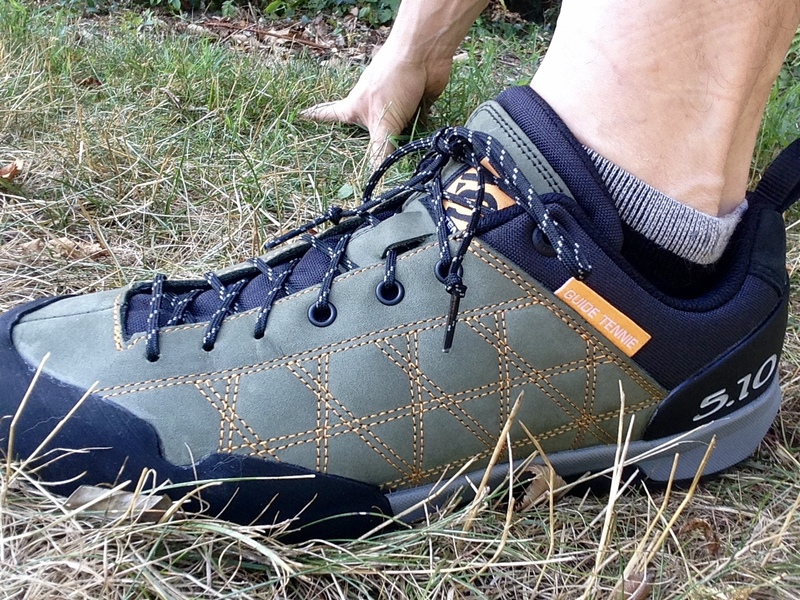 Second: I haven't tested them on especially long walks or hikes, but the Tennies seem to support me well on trails and uneven surfaces—even better, I think, than my hiking boots, thanks to the strong heel support and firm-but-sticky sole. However, on pavement, store floors, and other smooth surfaces, my sensitive feet soon start hurting. The Tennies are beautifully form-fitted, but not soft, inside or out. However, you can't have it all. Overall, these shoes are so high-performing, well thought-out, and good looking, I already know they'll become ever more treasured as I adventure far and near. Maybe I should buy more pairs now, to save on the annual price increases?